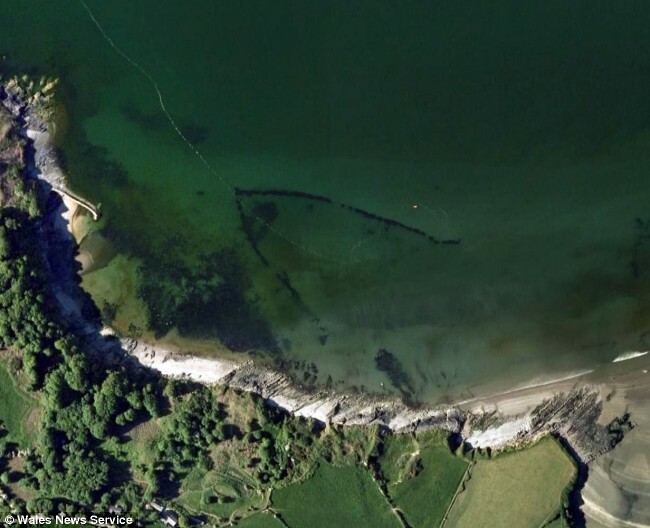 The article’s headline suggests archaeologists spotted this thousand-year-old v-shaped rock wall off the coast of West Wales using Google Earth, but really they were perusing more mundane aerial photographs. The unique shape of the rock structure helped the Normans trap fish without boats or anything at all. All they had to do was wait for the tide to go out and hundreds of fish would be trapped behind the rocks. 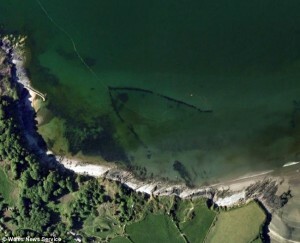 The trap is just 12ft deep close to Poppit Sands on the Teifi Estuary in Dyfed. Dr Otto believes the walls are made of locally quarried rock or boulders brought down to the coast by glaciers during the last ice age. The trap’s walls are covered in algae, worms and sea anemones. The wall is around three feet wide, and only the top foot is exposed. The researchers are unsure how tall the original trap was – and how much is buried under the shifting sands. These structure were so effective that their use in rivers was actually banned in the Magna Carta. Traps like this were only allowed along the coasts where stock was less likely to be depleted. This entry was posted on Monday, March 16th, 2009 at 10:48 PM	and is filed under Medieval, Multimedia. You can follow any responses to this entry through the RSS 2.0 feed. You can skip to the end and leave a response. Pinging is currently not allowed. Very neat! Have you been to Etowah? There is a weir in the river there. I haven’t. Is it medieval too? It’s native American. Not sure what time frame we’re talking about. Home to several thousand Native Americans between 1000 A.D. to 1550 A.D. So, if the weir there is contemporary with them, we have our answer. I’m not sure how old it is, though. I’ve been there, and I would think that a weir in a river would not hold up so well as it has at Etowah over the course of 400-900 years, so if it’s original, it’s certainly been restored. That is fascinating. Do you think the current would erode a river weir more than coastal tides and currents would? Clearly I’m going to have to make a trip to Etowah. Well, rivers have all sorts of debris and flooding episodes, especially in the days before the dams that pretty much rule the watershed on the Etowah River. The stones in the weird at Etowah are nowhere near large enough to withstand a serious flood, they seemed to be of a size that could be carried by a person fairly easily. One good flood with a log carried into it, and the wall would easily be damaged. Maybe not swept away, but definitely damaged. As for non-weir-related history… you should definitely go to Etowah. Make a day of it and hit Pickett’s Mill battlefield park. It’s right nearby, and makes for a good history day. They have a very well-maintained small museum about the US Civil War. Yes, you should go to Etowah! And to Pickett’s Mill. An article about the Etowah river in the Rockmart paper states that there are 36 weirs in the Etowah river. There are also lots of hits about paddling trips where you can see several of these. Thank you for the info, David. I’m immensely fond of small museums, so I’ll make a point of seeking out Etowah’s. This is very cool. See John McPhee’s account of weir-fishing still being used today in the Bay of Fundy! Sounds interesting. Do you have a link, perhaps? Ah, the Normans were a clever lot, very imaginative. No wonder they could create a trap like this. They weren’t the only ones (or the earliest ones) to use weirs to catch fish. lol @ 10 year-old reply. This is why I enjoy teaching. Kids crack me up. If you are still following, and if you haven’t found out yet Tayolor, a weir is a rockwall in a triangle shape with the long end up, and facing the bank of a waterway, especially along coasts. This allows fish to swim in while the ocean tides are up. When the tide goes back out, it leaves the weir dry, with the fish trapped inside the weir.